GRANVALLEY is a professional consulting company that solves customer problems using advanced data-driven techniques including Artificial Intelligence (AI), machine learning and data analysis with a client-focused, vendor-neutral approach. We discover hidden business rules and expose business insights based on “Data Sources” which are aggregates of various data from ERP, CRM, and IoT devices such as sensors, by employing Analytics and AI technologies. Through consulting on the effective use of data, GRANVALLEY delivers data-driven approaches to reform and improve business management. Since its foundation, GRANVALLEY has helped clients address business challenges through consulting services that use its unique methodologies with a customer-focused, vendor-neutral approach, employing artificial intelligence (AI), machine learning, and analytics tools on client data sources. Our proven performance has been reviewed positively by overseas media. For many years GRANVALLEY has helped clients build frameworks that provide high-quality data analytics to ensure the reliability of data needed for decision making. Leveraging the know-how accumulated from our extensive experience, we now build frameworks for preparation of high-quality data in artificial intelligence (AI) development. GRANVALLEY provides client-focused consulting that creates valuable and optimal solutions by pursuing the root causes of management and operational problems. Consequently, we have a proven record of providing services to companies in a wide range of industries that stretch from publicly listed companies in manufacturing, distribution, and retail to booming private-venture businesses. Since its foundation, under the theme of “effective use of the SAP BW data warehouse”, GRANVALLEY has had strong capabilities in developing management information platforms that incorporate data warehouses and analytics tools. Granvalley is widely known in the industry as a “SAP BW/BI consulting company”. 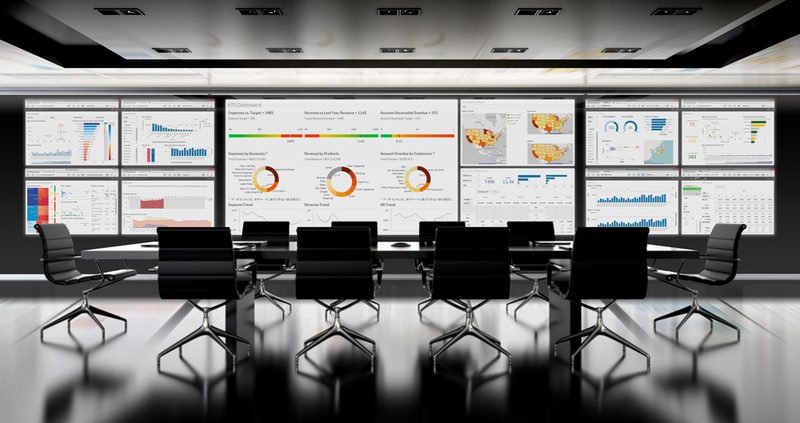 Traditional enterprise BI is used as the enterprise-wide data analytics platform for “global optimization”. This platform offers the advantages of securing data governance and supporting enterprise-wide business decisions. On the other hand, when changes are made to management indicators, it requires additional resource and time costs to adapt the system. In addition, this platform is not suitable for addressing individual analytic needs unique to particular divisions. 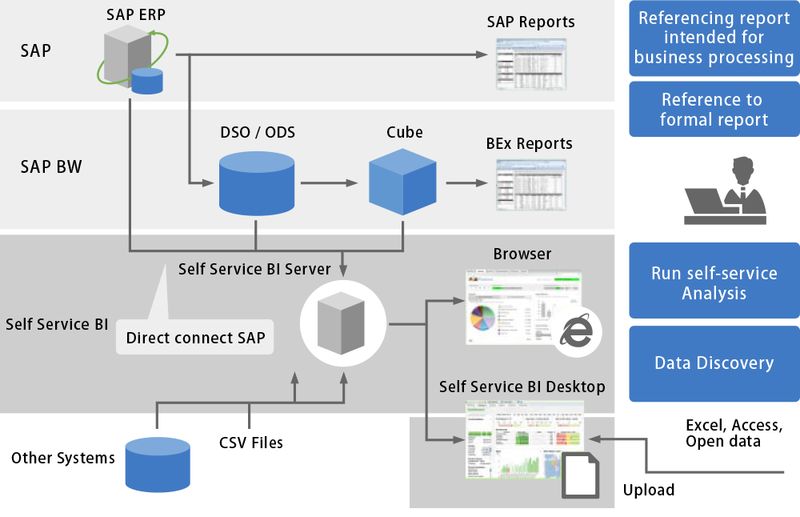 “Hybrid BI” takes advantages of both Enterprise BI and Self-Service BI. A combination of the two approaches enables rapid business decisions and data utilization throughout all divisions of the company, leveraging data from inside the company. The key to rapid delivery of “Analytics” is the reduction of the time taken from introduction to cutover. As a method for realizing faster data visualization, GRANVALLEY has developed the “Iceberg Approach”, adopting the advantages of both the traditional waterfall method and agile development. 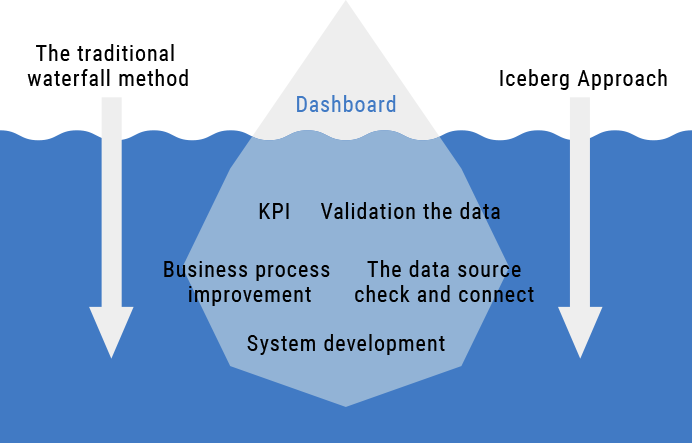 The Iceberg Approach provides the client with a clear image of expected results and delivers data analytics at minimum cost within the shortest period of time. In the global economy, which has been unpredictable due to economic slowdowns in emerging countries, many enterprises have been entering new markets, investing aggressively in new growth areas, or taking other progressive approaches towards further strengthening of competiveness. In the IT industry, changes include the evolution of cloud computing, big data and automation, new business creation employing IoT and Artificial Intelligence (AI), and drastic reforms of business processes. In this rapidly changing environment, business competition has become increasingly intense and diversified at a global level. For companies to be future-proof and achieve business growth, they must have an enhanced response to change and accelerated decision-making that directly leads to increased business opportunity. Since its foundation, GRANVALLEY has helped clients address business challenges through consulting services that use its unique methodologies with a customer-focused, vendor-neutral approach, employing artificial intelligence (AI), machine learning, and analytics tools on data sources maintained by the clients. Designed using the wisdom gained from our accumulated experience, the GRANVALLEY Management Cockpit is a unique concept that provides the ultimate in business management.This concept is aimed at supporting time-critical decision making by analyzing and visualizing the management information. GRANVALLEY builds business management systems based on this concept to enable data-driven management of the client company.Decision makers can make decisions at any time and anywhere. With GRANVALLEY Management Cockpit, there is no need to check business reports every day.